For years we have been told that our front loader washing machines must use special HE (High Efficiency) laundry detergent. No…not just any liquid or powder soap will do. It must be approved for HE (high-efficiency) washing machines. Blah, Blah Blah! High efficiency washing machines must meet a certain standard when it comes to water and electricity consumption. As a general rule, an HE washer will use about 1/6 to 1/10th the water compared to a non HE model. Less water means less dilution of the detergent causing more suds. Use “normal” laundry detergent in your HE washing machine and the washer will not be able to get rid of the suds or it will have to start a special cycle to get rid of the extra suds wasting energy. Yes, believe it or not our washing machine has such a cycle. It senses there are suds left over when the normal cycle is complete and starts a new one to get rid of the suds. While most folks think the HE detergent somehow lubricates the washer or makes the washing machine work better or last longer, it is not that complicated. High Efficiency(HE) detergent does not lubricate your washer. It does not prevent soap build up and it does not make your washer last longer. Because high-efficiency washing machines use so much less water, they would not be able to remove the suds (foam) a standard laundry detergent produces. There are a lot of high efficiency (HE) washing machine owner’s manuals that warn of washer damage by using non-HE laundry soap/detergent. 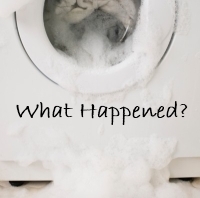 The damage they speak of can be caused by the suds overflowing inside the washer and coming in contact with sensitive electronics, computers and/or the main electrical motor. Using regular laundry detergent in an HE washer is most likely to only result in overflowing soap suds and a huge soapy mess in your laundry room. That’s it. Not rocket science but it makes sense. That is great news for us because most of the products that cause foaming (aka foaming agents like sodium laurel sulfate) are bad for our health, bad for the environment and bad for our septic systems. You can make homemade HE laundry detergent in both liquid or powder depending on your preference. We prefer the powder as it is easier to make, does not need any heat and is easier to store. The other great news is that making your own HE laundry soap is a lot less expensive than purchasing at your local grocery store. I have found that HE detergent, or detergent that is safe for all machines including HE machines, does not seem to rinse out. I used tiny amounts in the pre wash and 5 cycles later there are still suds. I hate HE detergent or more specifically, detergent that is safe for all machines (since I don’t even use an HE machine). It seems to be low sudsing but the low sudsing never ends. It must use some odd chemical process for it to be like this. Also I find if you over do it – meaning using just a low amount, it’s easy to develop the itches. I now avoid anything that is safe for an HE machine and avoid the HE symbol like that plague. Tide free and gentle makes two versions, an HE and non He (no good for HE machines) and I stick with non HE. Thank you for your comment. You are the first I have heard with this issue. The HE is supposed to be less sudsy than the regular detergent. Usually the HE rinses out much easier than non HE. Could you have very hard water? Or water that contains a lot of minerals? You can tell this by having it tested or using dish soap in your sink and seeing how easily it makes suds. Hard water can be so saturated with minerals that it is unable to dissolve the detergent. Maybe someone else who is reading this will have some insight. I am not a chemist and won’t try to pretend I know what is going on. Anyone have any ideas??? ?